1975 – The Jackson 5 announced that they were leaving Motown for Epic. They changed their name to the Jacksons since Motown owned the name the Jackson 5. The Jackson family, minus Jermaine, held a press conference at the Rockefeller Center’s Rainbow Room on June 30, 1975, to announce their new contract with Epic. Jermaine’s position in the group was still in question, though they were hoping he would ultimately side with them. Earlier that week, Motown’s lawyers informed them that they held the copyright to the name “Jackson 5″, and threatened to sue if that name was used at all. 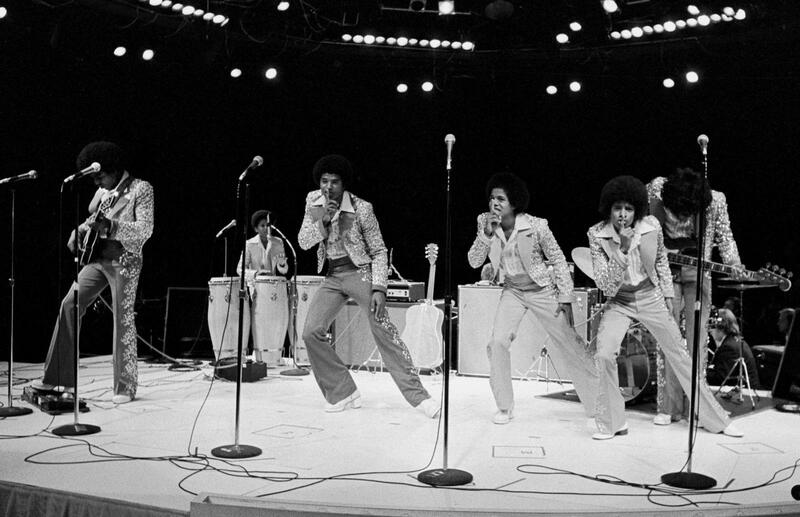 The group soon decided to use the name “The Jacksons”. With nine months left to go in their Motown contract, Joseph refused to let the group record more material for the label, prompting Motown to file a lawsuit against them. The Jacksons counter-sued the label for the right to leave the label. However, during the break, he received a phone call from Berry Gordy, who told him to leave the group there and then, which he did. The group went on without him, but the family was deeply hurt by Jermaine’s decision, especially Joseph, who had always resented Gordy’s patriarchal relationship with his sons. Jermaine remained at Motown as a solo artist he was released from his contract upon request in August 1983, in time for him to rejoin his brothers for their Victory album and tour. Little brother Randy, performing as a non-official member since 1972, stepped in to become the fifth official Jackson, while Marlon took over Jermaine’s existing lead vocal spots in their older songs. 1992 – Michael Jackson performs his Dangerous World Tour at Rotterdam [The Netherlands] Feyenoord Stadium. 2005 – Michael, Grace & the kids leave Paris and go to Manama, the capital of Barhain as guests to Prince Abdullah (a friend of Jermaine). It is made public on June 30, that Michael Jackson began a vacation at a prince’s palace in the tiny Gulf kingdom of Bahrain, his first trip overseas since being acquitted of child molestation charges, an official close to the royal circle said Thursday. Jackson and his three children arrived on a private plane from Europe on Wednesday night for an indefinite stay, said an official, who spoke on condition of anonymity because private visits involving the royal family are not authorized to be announced. 2008 – A new Akon & Michael Jackson collaboration called “Hold My Hand” leaked to YouTube and various other internet sites, but was removed within 36 hours. The song features both Akon and Michael Jackson on lead vocals, with Michael singing the first verse of the song, backing vocals and ad-libs. Akon’s representative at the time of the leak stated that Akon’s forthcoming album had not been completed, and as such there was no word whether or not “Hold My Hand” would make Akon’s album. In an interview in July, Akon stated that “Hold My Hand” would actually be Michael Jackson’s first single. The writer of the song, Claude Kelly, was interviewed by Billboard in July and said that “Hold My Hand” was due to appear on both Akon and Michael’s new albums. 1970 - The Jackson 5 became the first group to top the Hot 100 with its first three chart entries when "The Love You Save" boarded the top. The Love You Save" is a 1970 number-one hit single recorded by The Jackson 5 for the Motown label. It held the number-one spot on the soul singles chart for six weeks. It held the number-one position on the Billboard Hot 100 singles chart for two weeks, from June 27 to July 4, 1970. It is the third of four Jackson 5 number ones released in a row (the others being "I Want You Back", "ABC", and "I'll Be There"). "The Love You Save" also features side vocals of Jermaine Jackson singing alongside Michael in the final "Stop! The love you save may be your own" besides Marlon and Tito Jackson. 1981 - Michael Jackson's single "One Day In Your Life", a re-release of a mid-70s track, hit #1 in the U.K. replacing Smokey’s “Being With You”. 1992 - Michael Jackson launched his "Dangerous" world tour. The "Dangerous World Tour" kicked off at the Olympic Stadium in Munich, Germany. Michael played to a sell-out crowd of 72,000 ecstatic fans, who saw him perform 18 numbers, including 4 songs from his new album. Tour covers Europe, South America, Mexico and Asia from June 27, 1992 to November 11, 1993; sponsored by Pepsi-Cola, included 69 concerts to 3.9 million fans: 40 in Europe, 18 in Asia, 6 in South America, 5 in North America. The tour grossed up approximately $125 million and all profits were donated to various charities including the new Heal the World Foundation that was set up by Michael. Each concert began with a illusion-like stunt dubbed "the Toaster" in which following the ringing of bells and the roar of a panther, Michael catapults on to the stage through a trap door in the front, sending off pyrotechnics and electrifying the crowd. The transition from Thriller to Billie Jean was another stage trick. When Michael walks into a small space between two set "buildings," he secretly switches with a werewolf-masked backup dancer while he changes for Billie Jean. The backup dancer posing as Michael is placed into a coffin which disappears when dancers posing as skeletons and zombies drape a cloth over the coffin and pull it out. Michael appears fully dressed for Billie Jean in the upper stage level as it lowers down. During the performance of "Black or White", Michael ran onto the crane and started singing. 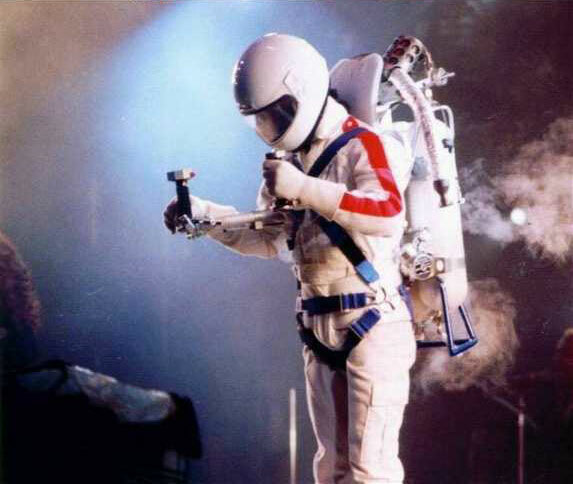 The end of the show hit headlines all over the world when "Michael" jet-packs, and flying over the heads of his fans and out of the arena using a rocket belt. 1995 - Michael Jackson's video "Moonwalker" was released. 1999 - Michael Jackson performed the benefit concert "Michael Jackson & Friends-What more can I give" at the Munich Olympic stadium. 1999 – Munich. - MCY.COM [the company which had acquired exclusive ONLINE rights to the "Michael Jackson and Friends" concert taking place on June 27, in Munich, Germany] announced in a press release that the online Internet broadcast of the June 27 benefit concert "Michael Jackson and Friends" recorded over 10 million hits, breaking the world record for a single online broadcast. The release states: Never before in the history of the Internet has a single broadcast received a response of this magnitude. In sharing this benefit concert with their online audience MCY.com provided further awareness and support to UNESCO, The Red Cross, and Nelson Mandela's Children's Fund; the beneficiaries of the event. Michael Jackson Company, Inc., with plans to phase out MJJ Productions.In other related matters, he has named Spokesperson Raymone K. Bain as General Manager, and has retained N.Y.-based L. Londell McMillan and The McMillan Firm, known for business restructurings and turnarounds, to oversee legal matters pertaining to his business affairs. Michael has previously announced plans to record an album which he predicts will be released in 2007. His recent Japan tour was the first in what will be a line of public appearances, and he is reviewing numerous offers to tour musically, which he plans to embark upon within the next several months.Michael, who is currently in Ireland on personal business, plans on relocating to Europe in the near future.He is continuing to build his management team and other appointments will be forthcoming. 2007 - Raymone Bain issues a press release to denie several false rumors about Michael & Grace and she reveals that he is currently in the studio putting finishing touches on his music. She also states that has not "left" Las Vegas nor is he being "evicted" from his residence in Las Vegas. He decided not to exercise the option to purchase the house he's been staying in since last December. 1971 - At Paramount Studios in Los Angeles, Michael Jackson cuts the lead vocal for “Got To Be There,” his solo debut. 1985 - Michael Jackson's album "Off The Wall" was certified 5 times Platinum by the RIAA. 1995 - Michael Jackson's "HIStory: Past, Present And Future Book 1" debuted at #1 in the U.K.
2003 - Michael makes a surprise appearance at the 3rd Annual BET Awards & presents James Brown with the Lifetime Achievement Award. 1999 - Michael Jackson hugs 11 year-old blood cancer child Lim Jae-Heon in his arms in the Bennigun's restaurant in Seoul. Michael is in South Korea for a June 25 concert benefiting children in North Korea and other war-ravaged countries (Seol, Republic of Korea). 1971 - Jackson 5 single "Maybe Tomorrow” is released. 1972 - Jackson 5 single "Lookin' Through The Windows" is released. 1995 - Michael is presented with the first ever "Michael Jackson Special Award" for his humanitarian work at the 3rd Annual VH1 Honors held at the Shrine Auditorium, Los Angeles. American actor Morgan Freeman presented to him with the "Special International Artist Award" for record sales and worldwide relief endeavors. 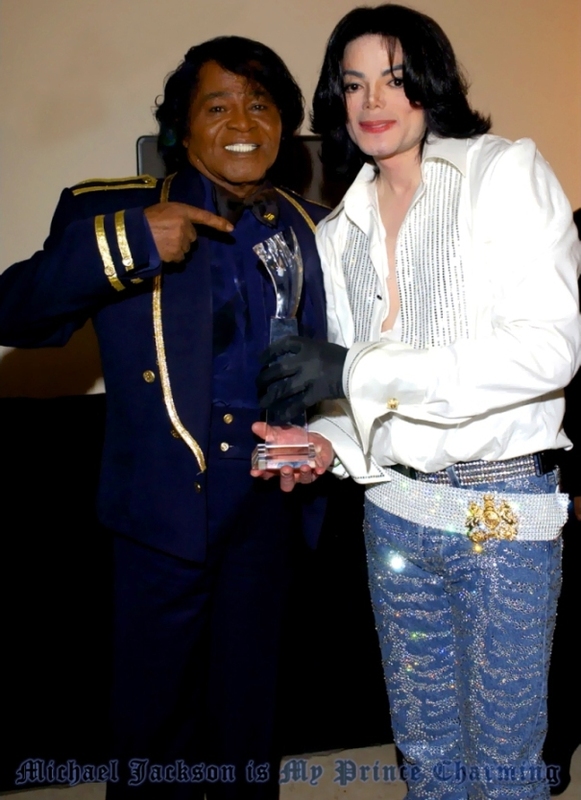 The award was later renamed the "Michael Jackson Special Award." Before the presentation the group Boyz II Men performed a medley of 'Heal The World' and 'We Are The World' and Michael joined for the last verse. Michael: I'm a big fan. Morgan Freeman: I'm a big fan. On behalf of VH1 we'd like to present this award to you for the work you have done over the years. Performing in charity [Michael smiles.] and in addition - listen to this now - VH1 is proud to announce the creation of a special VH1 International Honors Award for the King of Pop which will be presented in future to artists with their world wide charitable work following in the footsteps of yourself. Congratulations! Michael: I'm a major fan, he's a phenomenon. I mean it. Thank you. You've given me so much, it allowed me to take some of that love and pass it on to those people whose problems in this world need and deserve our help. A perfect example is the recent U.N. announcement that 1 to 3 million lives could be saved if Third World children were given a vitamin A pill three times a year. Cost per child is just six cents, that's all. So we must join together in healing the world so we can share this beautiful planet in joy and love. I love you very much. 1970 - Diana Ross was back at the Forum, this time as an honored guest in the crowd, sitting with Berry Gordy and Corporation™ team leader Deke Richards. In the intro to this song – another Sly & The Family Stone cover – Michael points out Diana in the crowd; this clip from later in the tune spotlights the beautiful Jackson family harmonies singing in tribute. Johnny, Ronnie, Jermaine and Tito, each called out by MJ for their solos, who does his best James Brown imitation. 1973 - Michael Jackson is on Recording Session for Touch The One You Love. Produced by Mel Larson and Jerry Marcellino. Composed by Artie Wayne and George Clinton. This song was recorded on 14th June 1973, and included in an updated mix on Michael's Farewell My Summer Love album, issued in May 1984 in the US and June 1984 in the UK - a demo version is known to exist. 1975 – Michael Jackson’s Moving Violation is 36 at Billboard 200. Moving Violation is the ninth and final official studio album released on Motown Records by The Jackson 5. It is the second and last single lifted from the album. 1995 - Michael & Lisa Marie granted their first interview as a couple to ABC's "Primetime Live". The legendary interview, held by Diane Sawyer, was broadcast live around the world. With estimated 60 million viewers, the interview became the second-most-watched [viewership] interview of all time. The most-watched interview of all time is up to today Michael's interview with Oprah. The questions were insensitive or perhaps, indelicate. But they were enough to transform the voices of a delightful duo into a defiant duet. Despite troubling questions laced with "perverse curiosity" were asked them in a live interview by Diane Sawyer that could tarnish the reputation of the world's greatest recording artist, The King of Pop Michael Jackson and his wife Lisa Marie Presley-Jackson met the interviewer head on and didn't blink. It was Mrs. Presley-Jackson, who was quick to defend her husband against every negative, image-damaging question Sawyer implied that inquiring minds wanted answered. What Michael and Lisa wanted the "Prime Time Live" viewers to know was something about their intimate side as lovers, parents and best friends. They had a good reason for wanting to tell their story to ABC-TV's estimated 60 million viewers-the largest audience in the ABC news magazine's history. As the interview was winding down at Sony's Culver City studios, where it was broadcast, the couple emphasized that they were not only married lovers, but they were best friends. "I just want people to know what they're dealing with... and understand that we are not jokes. The degrading comments and all that kind of stuff, it's really irritating,"
Mrs. Presley-Jackson told Sawyer as she concluded the interview. Michael's parting salvo was delivered to Sawyer's TV audience with subdued anger. "Don't believe the garbage, all the tabloid junk. Don't read it, don't listen to it. It's garbage, it's junk. It's stupid. Enough of it." During the "Primetime" interview, the video for "Scream" premiered. The futuristic video clip, directed by Mark Romanek, earned Michael another record and is featured in The Guinness Book Of World Records as the most expensive video of all time: US$ 7 million did it cost to make "Scream". The video clip, in which Michael again took the art of making videos to another level, is seen as groundbreaking for the future of computer animated clips! The shooting of the video clip took place at Universal Studios [Universal City, CA, U.S.A.]. It took 9 days to complete shooting of the clip "Scream". The short film takes its viewers on an immensely emblematic journey into the 7 different, hereafter mentioned, spaceship rooms: GRAvity, HABITation, GALLery, MEDia, mEDITation, OBSERVation and reCREATion. Four choreographer's were working on the dance routines: Travis Payne and LaVelle Smith with Michael; Tina Landon and Sean Cheesman with Janet. Michael's make-up was created by Karen Faye, Janet's make-up was created by Kevin Aucoin. 1997 – Michael Jackson is still in Germany on his History World Tour. 2001 - WKTU Radio in New York let the cat out of the bag when it announced the title of Michael's new album: "Invincible". 2002 During his England visit Michael tours the Houses of Parliament accompanied by Uri Geller & magician David Blaine along with MP Paul Boateng. At the invitation of Magic Circle member Lord Janner, Michael drops in on a surprise birthday party being held for MP Paul Boateng; when Michael sang "Happy Birthday!" to him, Boateng was absolutely blown away; after the party they took a walk along the Thames on the back patio of the Parliament (Westminster, London, UK). Pop star Michael Jackson and psychic Uri Geller are mobbed by fans as they catch a train at Paddington station in London. Jackson is due to support his friend Geller at a fundraising event in Exeter later on Friday to raise funds for Exeter City Football Club and local charities. 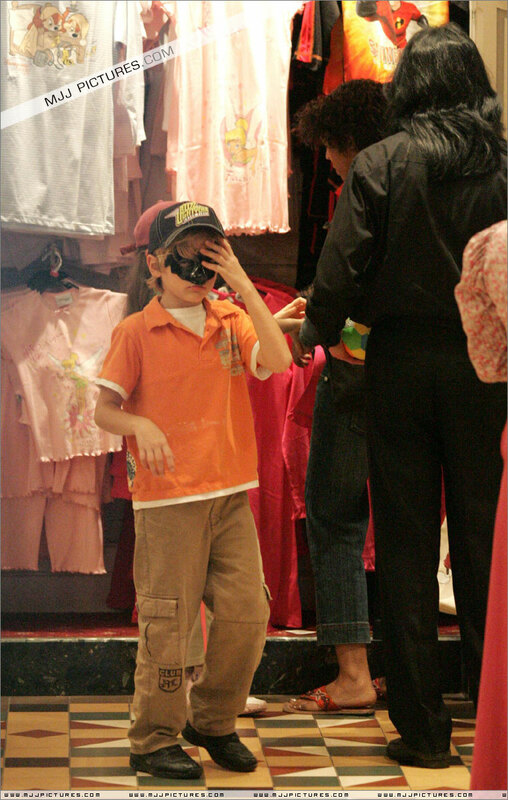 2006 - Michael, Anton, Grace & the kids go to Disneyland Paris where they check in the New York Hotel. 2007 – Michael Jackson is on BlackAmericaWeb.com Exclusive Series: 20 People Who Changed Black Music – Michael Jackson, the Child Star-Turned-Adult Enigma. ...When it comes to the history of black music -- or simply music, period -- very few people have achieved accolades, success and the adoration of fans throughout the world like Michael Joseph Jackson. Not only has Jackson dominated pop and R&B charts over the course of five decades, he ushered in the MTV era, helping the burgeoning network draw viewers in the 1980s with his music videos that were more feature-film than a few minutes of smoke and mirrors to sell a song. The most awarded recording artist in history, Jackson is a double inductee into the Rock & Roll Hall of Fame – as a member of the Jackson 5 and as a solo artist. 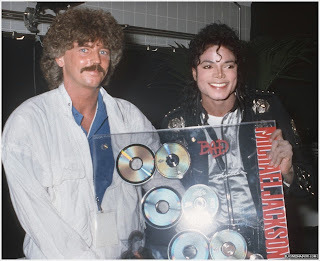 With his albums reaching platinum status multiple times over, Jackson has truly earned the symbolic Guinness World Records title Most Successful Entertainer of All Time... Despite the controversy, Jackson remains one of the most popular musical icons of all time. He is especially beloved overseas, where throngs of fans appear whenever he is out in public. Even in the United States, Davis said, his star still shines bright, if not in mainstream circles... He is a super talent, regardless,... Sometimes you find super talented people that are very eccentric, and that’s Michael Jackson. People get wrapped up in his personal life. And at the end of the day, that’s really none of our business. 1973 - Michael Jackson is on recording Session for "You've Really Got A Hold On Me". 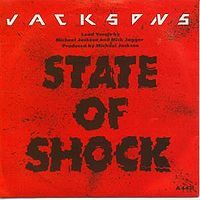 1984 - The first single from The Jackson's Victory album, State Of Shock, is premiered on radio stations. 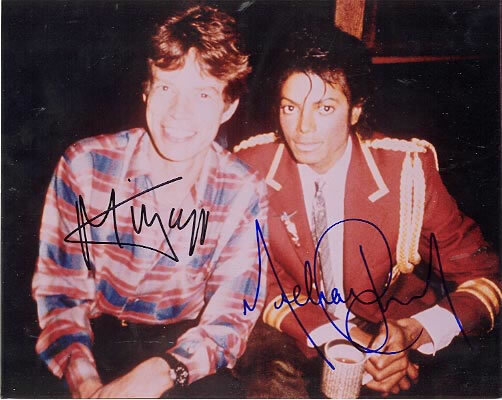 The duet between the Jacksons frontman Michael Jackson & Rolling Stones frontman Mick Jagger is an instant success even though no video is shot for the song. Mick Jagger didn't hesitate when Michael Jackson told the Rolling Stones singer to warm up his vocal cords before recording their duet "State of Shock" in 1983. "State of Shock", the successful hard rock song, was the biggest hit from The Jacksons' Victory album, reaching number 3 on the US Billboard Hot 100 and number 14 on the UK Singles Chart. The song was originally recorded with Freddie Mercury, as Michael and Freddie had been working on several tracks at that time ('81-'83), e.g. the unreleased title track "Victory" for the eponymous album and "There Must Be More to Life Than This" from Mr. Bad Guy. The final version featured lead vocals by Michael Jackson and Jagger. "State of Shock" was the last top ten hit for The Jacksons, as well as their last single to be certified gold. The song was later revised by Jagger when he performed it with Tina Turner during their legendary 1985 performance at Live Aid. 1992 – Michael Jackson performs his Dangerous World Tour in Paris, France, attending 85,000 at the Hippodrome of Vincennes. 1997 – Michael Jackson performe in this Friday 13th his History World Tour in Kiel, Germany at the Nordmarksportfield, attending 55,000. 1995 - The short film, Scream, directed by Mark Romanek, premiers on MTV BET. Its single, Scream, was a duet with sister Janet Jackson set to a high-tech groove. [caption id="" align="alignleft" width="250" caption="Michael with his littel sister Janet appeared together in his Scream short film"] [/caption]Michael Jackson performs in his new "Scream" video in this undated picture which was released in Los Angeles Tuesday, June 13, 1995. The video will be previewed Tuesday night on MTV and will premiere Wednesday night, June 14, 1995, on ABC-TV. "Scream" marks the first time that Michael and Janet Jackson have appeared together in a video. 2001 - Producer David Gest confirms that "Michael Jackson: 30th Anniversary Celebration, The Solo Years" is a go! The all-star salute to the King of Pop is confirmed for two concerts at Madison Square Garden, will feature more than 200 stars and take place in New York on September 7, 2001 and September 10, 2001. CBS announced they will broadcast the mega event in fall as a two-hour special on CBS. 2002 - Michael Jackson inducted into National Academy of Popular Music/Songwriters Hall Of Fame at 33nd annual induction ceremony. [caption id="" align="alignleft" width="250" caption="Michael & Liza - Liza Minnelli & David Gest accept the award on his behalf."] [/caption] SHoF honors the contribution of popular music songwriters who have written the soundtrack for the nation’s history. As a songwriter, Michael penned more than 150 songs, with more than 20 reaching multi-million performance status on American radio and television. Liza Minnelli & David Gest accept the award on his behalf (New York City). 2005 - In a series of interviews with Martin Bashir, broadcast in 2003 as Living with Michael Jackson, Jackson was seen holding hands and discussing sleeping arrangements with a 13-year-old boy, who later accused Jackson of sexual abuse. Shortly after the documentary aired, Jackson was charged with seven counts of child molestation and two counts of administering an intoxicating agent in relation to the boy. Jackson denied the allegations, saying the sleepovers were not sexual in nature. The People v. Jackson trial began on January 31, 2005, in Santa Maria, California, and lasted five months, until the end of May. On June 13, 2005, Jackson was acquitted on all counts. After the trial, in a highly publicized relocation he moved to the Persian Gulf island of Bahrain, as a guest of Sheikh Abdullah. After seven days of deliberation the jury has reached a not guilty verdict on all 10 counts in the trial against Michael Jackson. Jackson was charged in a 10-count indictment with molesting a boy, plying him with liquor and conspiring to commit child abduction, false imprisonment and extortion. He pleaded innocent. 2005 - "History" is a song on Michael Jackson's album, HIStory. At the beginning of the song there are various quotes from the history of America including one from Michael Jackson from when he was in the Jackson 5. Some quotes are also put in the middle of the song including one from Martin Luther King. It was composed by James Harris III and Terry Lewis. The vocals are sung by Boyz II Men. The song lasts for 6 minutes and 34 seconds with the last minute being used for other quotes in American history such as ones about Rosa Parks, the Statue of Liberty, Disneyland, the Berlin Wall and the first man on the moon. A remix of the song was featured on Michael Jackson's 1997 album, Blood on the Dance Floor. On June 13, 2005, Jackson played this song on his official website in celebration of his acquittal. 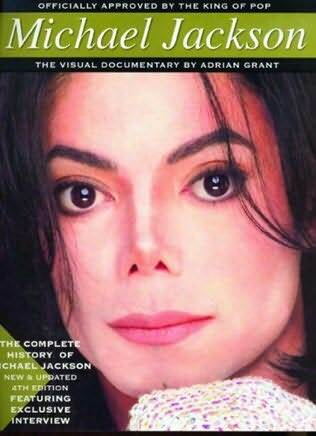 2005 - Michael Jackson: The Visual Documentary by Adrian Grant is published. [caption id="attachment_51" align="alignleft" width="217" caption="Michael Jackson : The Visual Documentary"] [/caption]Is said to be the most comprehensive book ever published on the world's greatest pop superstar. From the Fifties to the present day, it is a complete record of Michael's moves, grooves and music. Illustrated with hundreds of colour and black and white photographs. Includes all Michael's records, concerts, videos and awards, his public appearances and dazzling performances, memorabilia and records; faithfully compiled by Adrian Grant, a writer renowned for his close affiliation with Michael Jackson and a pioneer in many Jackson fan related projects. 2007 – The Michael Jackson Conspiracy, by Aphrodite Jones, is published. 1999 - David O. Selznick's 1940 Best Film Oscar for Gone with the Wind (USA, 1939) was bought by Michael for $1,542,000, at Sotheby's, New York City. The Academy Awards no longer permits such sales, all but ensuring that it will remain the most expensive Oscar! 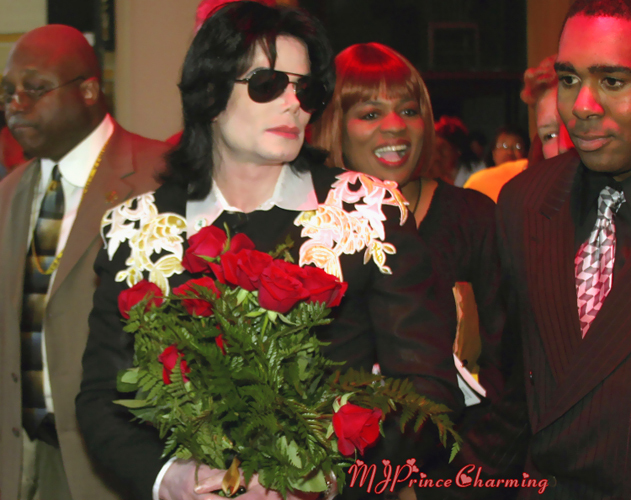 2003 - Michael is honored in Gary, Indiana with an award for “Outstanding Achievement & Commitment to Humanitarianism” during his return to his hometown for the first time in 20 years. Michael goes to the City Hall where the Mayor King presents him with a “Key to the city”. He is presented by 2 selected admirers with 5 books filled with messages from his fans & a bouquet of roses, a single white rose in the middle representing the singer, along with the value of “Truth, Intergrity, Purity & Strength” whereas the pink roses – “All of the fans & fan clubs that form MJ Unity”. He then returns to his childhood home at 2300 Jackson Street where he grew up & where the Jackson 5 performed in the 60’s, including the Roosevelt High School. There, he tells students that “with a will of iron, with perseverance and determination they can do anything they want.” He is given presents & made an honorary Roosevelt graduate. In the evening he attends “Salute to the Troops” an event held at the Baseball Stadium (Gary, Indiana). 1988 - Michael performs BAD tour at Feijenoord Stadium in Rotterdam, Netherlands.